It seems that there is a little bit of a love/hate relationship with Crest Gastropub. Some people love to hate it, other hate to love it and many people love the friction between those two groups and the rest. It does not seem that things have changed much since my last visit there. And as most of you know breakfast is my sixth favorite meal (Brunch is fifth, Snack time is fourth, Second Lunch is Third, then dinner and finally lunch). However, I had a $40 gift card taking up space in my wallet and I had not had any quality time with the Dining Duder in quite some time. Taking a lesson from the duder, who frequents the Crest frequently, we opted to arrive at opening and watched the place fill to capacity in about twenty minutes. I did a little Crest research to prepare for my visit. I read then disregarded the Yelp reviews and took a look at any other recent articles to look for common themes. The only writer I have a good sense of palate for is G.A. Benton since our tastes seem to be consistently aligned so I reread what he had to say but popped through the door with an empty stomach and an open mind. First we will analyse aesthetics of the place. It looks great. For brunch, it seems they feature live music instead of Muzak. The quality of the musicians was good but the volume was too loud (and not because I am too old). It was difficult to hear our server and occasionally our conversation. Neither the staff nor the musicians seemed to pick up on this. In my book, anything other than light background music is too much. The conversation with a meal and sometimes the quiet of a meal, is as important to me as the meal itself. I was sad to see the wood serving boards are still in use. They look worse for wear and still serve no practical purpose. Service was fine, it met expectations but I have yet to visit and have expectations exceeded. As is often the case, the first two beers I tried to order were not available. Not a big deal if the Crest is going through beers that fast it is good for them and the craft beer community. I’m not sure how they can figure out a way to have their printed menus keep up with their beer sales. Now for the food. What I really wanted to try was the coconut quinoa porridge but this was not available. The duder ordered the Shagbark chili made with adzuki (hails from Japan) and black turtle beans, with cilantro and sour cream. The beans and the chips all come from Shagbark Seed and Mill in Athens. My pre entrée order was honey-glazed cheese balls which never disappoint. 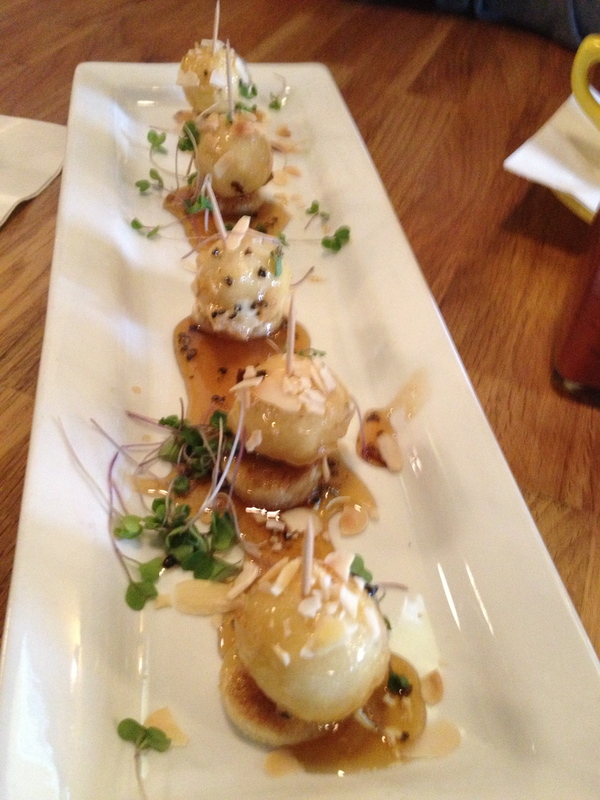 The great balls of cheese are made with fried Lucky Penny chevre goat cheese dipped in honey with slivered almonds and a scattering of micro-greens to mix with the leftover honey. My main was the Ohio bison burger with pancetta, house made boursin cheese, charred onions & mixed greens on a brioche bun. 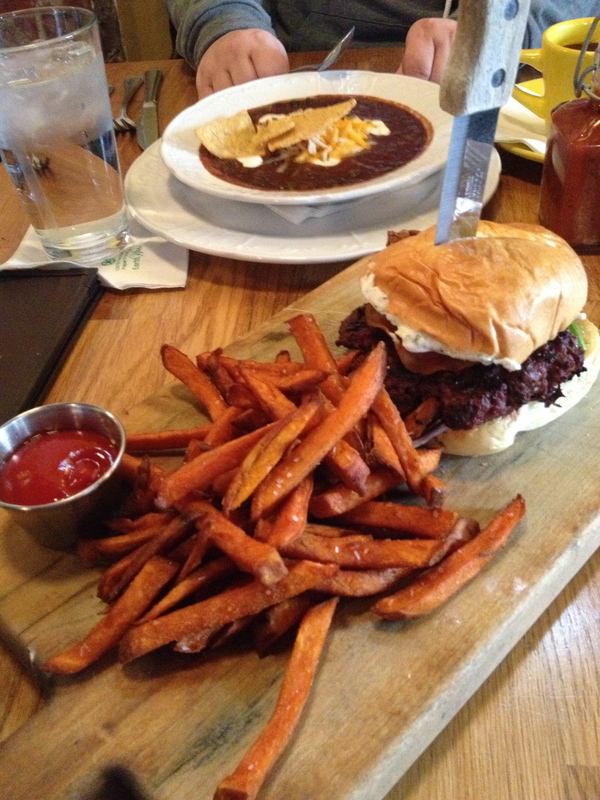 It is a fine burger with very good sweet potato fries. But not craveable. I will still take a burger from nearby O’Reilly’s over just about anything. The Dining Duder and I were both happy to see the Lebanese flavors of the chef and the Mediterranean / Middle Eastern traditions of the owners making more appearances on the menu so we shared the Mediterranean breakfast. 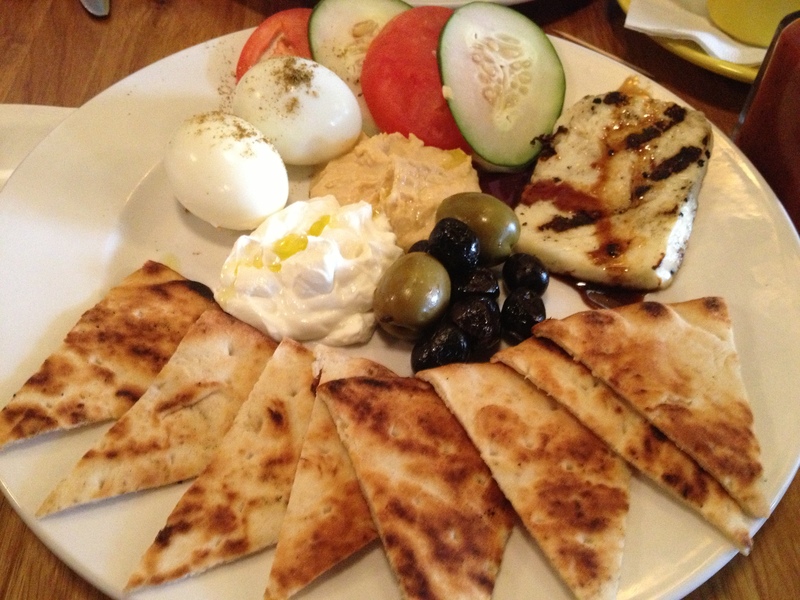 This includes grilled halloumi, lebneh, olives & hard-boiled eggs with hummus & pita. Loved it for being simple and sophisticated at the same time. Halloumi is a cheese made with goat and sheep’s milk. Lebneh is a style of strained yogurt that is perfect for dipping and mixing with other foods. So decent food, good beer list and still some things to hammer out to move on to the next level but considering they have less than a year in the game, I think they are doing well. One final note, the house made hot sauce on each table is a great addition to the flavors on the plate and the feel of the place. I look forward to the summer and seeing what the Crest can do with their gardens. This entry was posted on February 5, 2014 at 9:59 PM	and is filed under breakfast, Clintonville, restaurants. Tagged: Crest, Crest Gastropub, The Crest Gastropub. You can follow any responses to this entry through the RSS 2.0 feed. You can leave a response, or trackback from your own site. Good review – I have the love/hate relationship with the Crest you describe. Would love for it to be a bit better and the service has always been pretty poor in my visits (it gets crowded so I understand that it can be tough) but despite that I still am glad we have it in Clintonville and will still keep going.